If we’ve said it once, we’ve said it a thousand times — it’s a bad idea to sleep with your smartphone. Despite that, people do it. In fact, according to a new survey, a vast majority of us do it. The new survey, commissioned by Bank of America, indicates that more than 70 percent of us are sleeping with our smartphones next to us. For many, checking their phone is not only their last interaction of the evening, but the first thing they reach for in the morning (35 percent) before their coffee (17 percent), toothbrush (13 percent) or significant other (10 percent). Sounds from notifications can keep you awake or even make you sit up and check on them. If you turn off the sound on the phone or put the phone on “vibrate,” the screen still lights up every time you get an email or a text. Even the “buzz” the phone creates when it’s on vibrate can disturb your sleep. The smartphone screen itself can harm your sleep cycle. Smartphones, tablets, computers and some televisions give off blue light, which tells your brain that it is time to wake up. Even if you turn off all notifications, there will be a temptation to check your phone to make sure no “important” emails, texts, Facebook posts or Tweets need your attention. 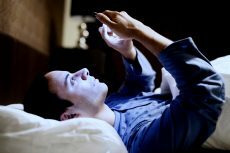 A growing number of people are reporting a fairly new type of sleep disorder called “sleep texting”. Individuals who sleep text will send notes to their friends and family without having any recollection of doing it. So, if it’s such a bad idea, why are nearly three-quarters of us sleeping with our phones? The Bank of America survey has an idea. According to the poll, nearly four in 10 (38 percent) U.S. adult consumers never disconnect from their smartphones, and only seven percent shut down entirely on vacation. Meanwhile, 89 percent of adults check their smartphones at least several times a day, and more than one-third (36 percent) report they constantly check their devices. Finally, if asked to refrain from smartphone use, nearly half (44 percent) of Americans say they couldn’t last 24 hours. What it comes down to is that we’re addicted to connectivity. For the sake of a good night’s sleep, we here at SleepBetter hope everyone can learn to put the phones away (outside the bedroom) when it’s time to turn in for the night.